Born of wealthy parents, Fidelis was conspicuous from his early childhood for his remarkable talents. He was always to use these talents to the greater good and the expounding of truth, even when it was to cost his life. After receiving doctor's laurels in philosophy and law at the University of Freeburgh, Fidelis traveled for six years through Europe with three companions. For some time he followed his profession as a lawyer. His clients admired his wisdom and justice. Gradually he began to rebel against the corruption in the practice of law. When he was offered a bribe to prolong a case, he decided to enter religious life. Having noticed the Capuchins at work for some time, Fidelis studied the Order's Constitutions, and was so impressed that he asked admittance to the Order. Fidelis was first to be ordained a priest to prove his sincerity and after the ordination was admitted as a Novice. As a Novice, Fidelis had many trials, but he maintained a humbled spirit. His courage would help him throughout his life. He determined to preach to the Protestants the true faith as soon as possible. After solemn profession, Fidelis was allowed to preach to both Catholic and Protestants, something that was unusual in those troubled days and dangerous as well! His preparation was study, writing, prayer, and penance. With fiery words, Fidelis preached against the Protestants. To the anger of the Protestants, a great many were converted and lapsed Catholics were returned to the faith. 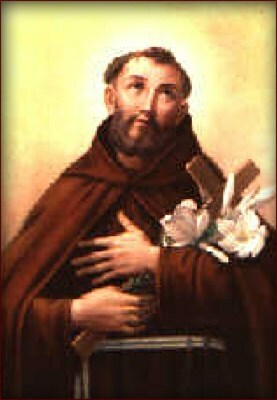 Fidelis became Guardian and was a source of great edification to all the Friars. The spirit of contemplation ruled the house. He and his brothers nursed the soldiers and cared for them spiritually, thus angering a number of Protestant leaders in the army at that time. To a companion he confided that he had two wishes; one was the grace never to commit a mortal sin, the other was to die for the Faith. God granted his prayers. Pope Gregory XV sent him to Thetia where the Saint preached for three years and converted a great number. The Calvinist preachers stirred up the people and on April 24, 1624, Fidelis mounted the pulpit for the last time, as he started to preach "One Lord, One Faith, One Baptism" there was an uproar and he was dragged to his death.